In 2018, on our website out the related buildings Design LUNA DNK-PRIME and Phanteks Enthoo Evolv Shift. In my opinion, readers were interested to the main topic addressed in these articles. Once again we have seen that even in a small package to actually collect the productive system, which in terms of performance little inferior to full-scale systems. Then I thought about writing the special issue of “Computer of the month”. are planned. Yes, in February we were pleased with AMD, which has produced a very interesting hybrid chips Ryzen Ryzen 5 2400G, and 3 2200G with integrated graphics generation Vega. At the same time, still there is a worldwide shortage of video cards, so 2018 continues to be unfavourable period for purchase of the system unit from scratch. A sad prognosis: it is very likely that the increase in prices on gaming graphics will continue until the third quarter of this year. In General, it is time to mentally get used to this state of Affairs. To wait with your build a “normal” PC in March, there is a sense in the fact that in April, AMD and Intel will introduce the next novelty. “Red” will release processors Ryzen second generation, which will have higher clock frequencies. Partners at the same time AMD will present the motherboard on the base chipsets of the 400 series. In turn, Intel will give a start to sales of new models of processors of Coffee Lake and matplot-based chipsets Junior 300-series. These announcements will increase competition in the market, and will also allow users for the same money to collect over a fast system unit. Well, the March lull before the storm allowed me to fully switch to the writing of this special issue. In the “Computer of the month” always identifies current models and prices. In my view, this issue should become a complete guide to the selection of components that will allow you to get a small gaming PC. And it’s not just about the Russian retail, but also for the purchase of goods abroad. Unfortunately, the range of products in our country is noticeably inferior in the same in Germany, USA and China. I believe that the compact Assembly of the system unit is one of those cases when you can actually bother to get the model you’re interested corps abroad. The motivation to build a compact PC in my opinion, quite obvious. People come to this decision both from aesthetic considerations as well as practical. In the first case we are talking about the organization of space around them. So the system unit, assembled in a small thin case, perfectly fit next to the TV. Compact computers collect, including in order to not take up much space on the table. These blocks are placed under/behind the monitor, sometimes hung on the walls. Finally, the motivation for the Assembly of a small system is a common desire to experiment and try something new. Even in 2018 are constantly faced with the opinion that on the basis of small body it is impossible to create a really efficient system. Yes, you can’t build a PC with two graphics cards on Board (although enthusiasts are working at this moment), but nobody will prevent you to use the fastest single chip graphics card of today. 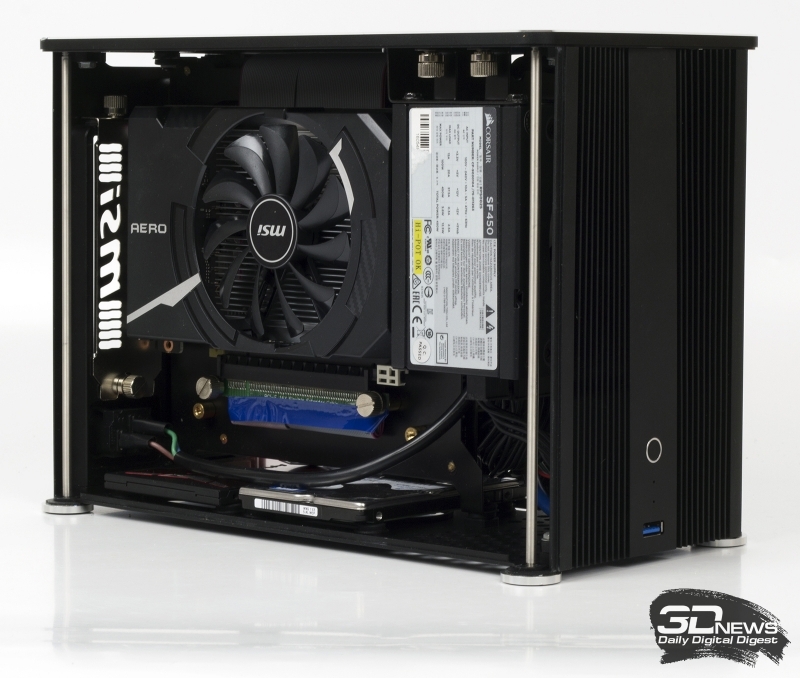 Last year on our website an overview of the computer case Dr Zaber Sentry. On its basis were collected for system with 10-core Intel Core i7-6950X and the reference version of the GeForce GTX 1080 Ti. The careful study of the configuration and customization of the system allowed us to create a highly productive machine with a volume of 7 liters, which when performing various tasks, such as games and graphics rendering, do not overheat. It is obvious that the use of less efficient components, to organize effective enough cooling inside the case would be even easier. It’s funny, but the real cons of compact system discuss quite rare. The various discussions is in the shadow of a moment like price: for the same level of performance configuration, assembled in a tiny package, are often more expensive. 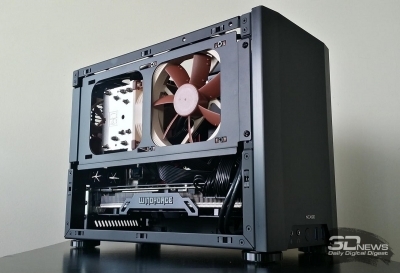 And if the conventional system is based on a particular Tower-building, you can save money on most of the components in the case of a small PC to do this not always. 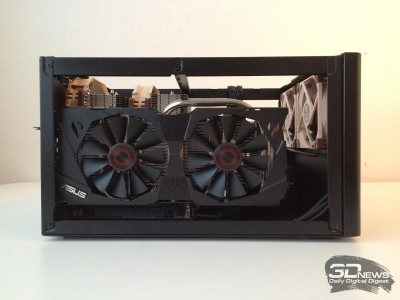 So, if the housing supports the installation of only power supplies form factor SFX, if you wish to build a system with a graphics card will have to take the corresponding source. SFX-units with capacities from 500 watts are not cheap. And the choice of some components of matplot, graphics cards, cooling systems is significantly restricted. All of these factors undoubtedly influenced the acquisition of future compact system. And yet many enthusiasts, this fact does not stop. Perhaps, it’s not stopping you. I have repeatedly noted that during Assembly of any system the most important step is choosing the right components. In the case of compact systems to “dance” should be peccatoribus. None of the mini-PC does not tolerate mistakes when choosing components. 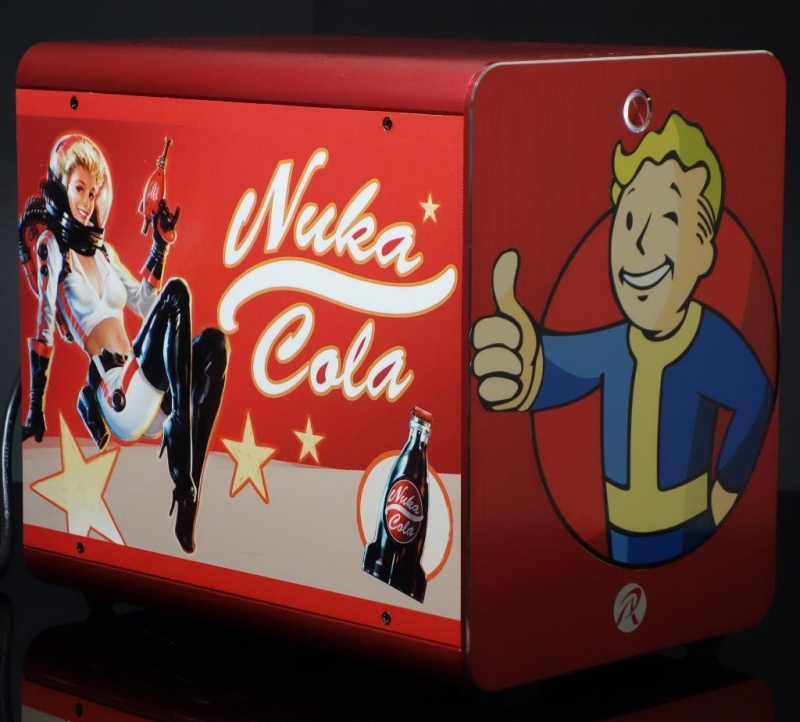 Besides a great experience for the Assembly of small but powerful computers allows to say that blindly believe the constraints imposed by the manufacturers of the enclosures is not necessary. Sometimes in compact cases to fit the bigger iron than specified in the Datasheet, sometimes does not get anything at all. Small packages can be divided into three types: in sale you will find models form factor Slim Desktop (examples — Dr Zaber Sentry, Fractal Design Node 202), Mini-Tower (Fractal Design Define Nano’s, Phanteks Enthoo Evolv Shift), reminiscent of the usual corps-tower and the buildings cubic shape, commonly called a barebones (they are also very often relate to the form factor Mini-Tower examples — Fractal Design Node 304, Cooler Master Elite 110). Model belonging to the form-factor usually have a similar design. So ASUS Slim Desktop components are installed in the same plane. In this area with the motherboard and video card are separated from each other. This is clearly seen in the photo above. A key feature of such buildings is the total lack of extra fans, i.e. CPU, graphics card and power supply have to rely only on the capabilities of their own. CPU cooler in most cases needs to be low profile, although some enthusiasts manage to install these systems in single-section maintenance-free “dropsy”. Again, in some cases, in buildings Slim Desktop has the opportunity to secure the only 2.5-inch drives, as large baskets, such devices have not. SilverStone RVZ02B-W (6 000 RUB.). The names of those you will read again and again. Zalman M1 (5 000 RUB). We see that among the models Mini-Tower, available in our stores, there is significantly greater diversity. 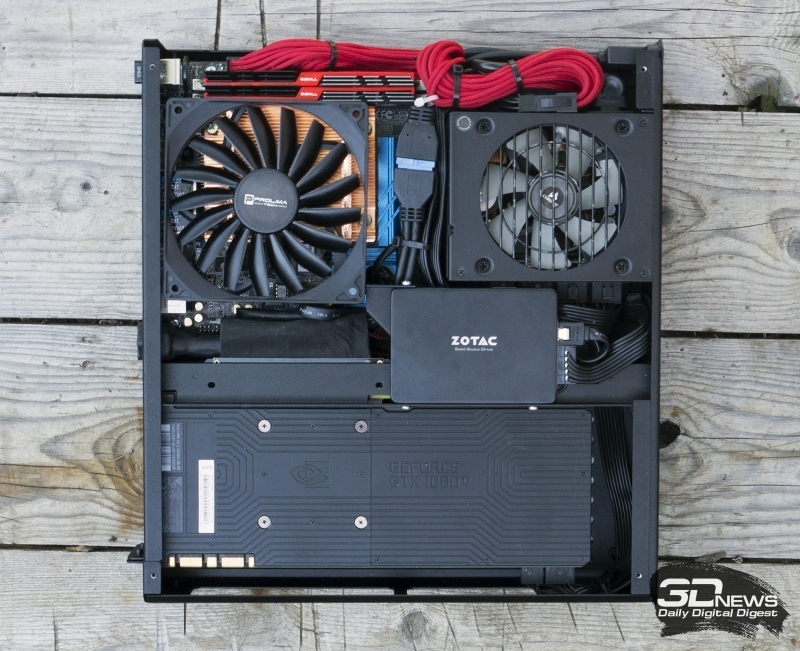 Housing cubic shape also in most cases allow you to use 3.5-inch hard drives and full-length graphics cards and power supplies. 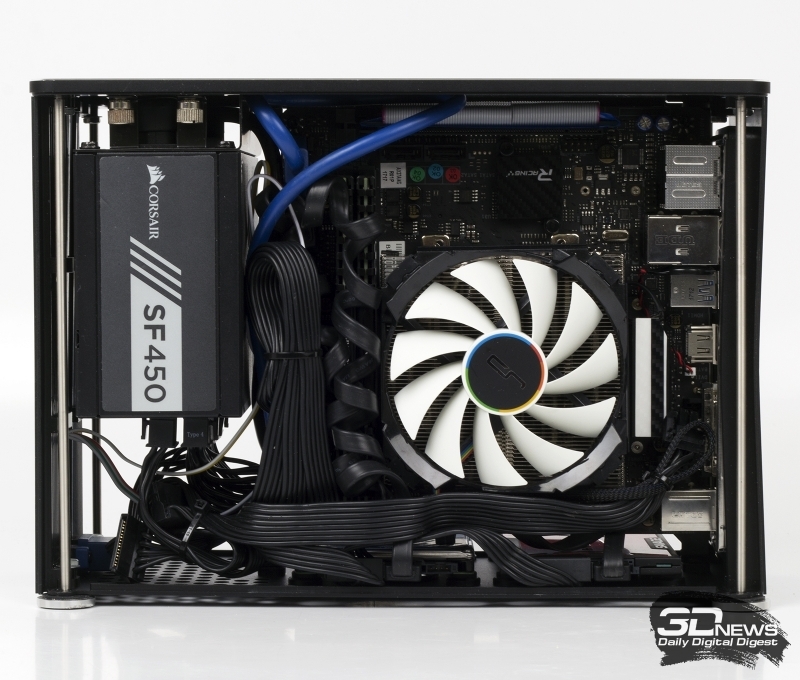 If the PSU in such a device is not on the motherboard (as shown in the photos above), the user can safely install low coolers of the tower type. Fractal Design Node 304 (4 500 roubles). As I said earlier, in foreign online stores, you can find more interesting models, so I advise you not to limit your horizons chassis, available in Russia. 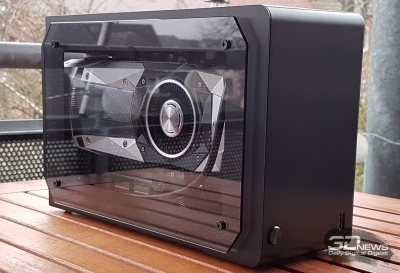 For example, in the German shop Computeruniverse, you can buy such interesting devices as Phanteks Enthoo Evolv ITX, SilverStone Fortress FT03B, Quite the Prodigy, Antec Cube and its performance UMX1 Plus Mini. A lot of interesting models sell on AliExpress. You know, it is very difficult to pass any JONSBO UMX1 or C2. Are very popular and cheap Realan aluminum case D3. And every year on the basis of such crowdfunding sites as Indiegogo and Kickstarter, is raising funds for the production of unusual types of cases. In most cases, is compact. A successful campaign not only made it possible to produce several small batches of exclusive products, but also to adjust production. Already the iconic DAN A4-SFX, NCASE M1 and NFC S4 Mini can be safely ordered in different online stores. Actually I could go on to list some interesting models, but, in my opinion, given the name alone was enough to make the final choice. 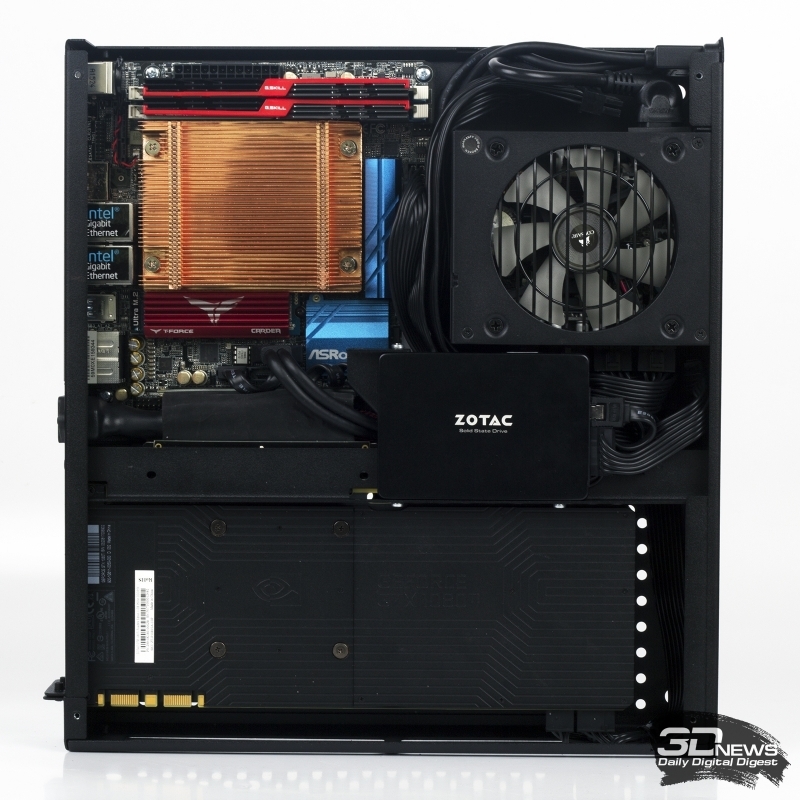 If you have decided on the case, you can choose the other components will not be difficult. Moreover, as in the case of housing, the choice of components for Assembly of mini-PC severely restricted amid devices of standard form factors. 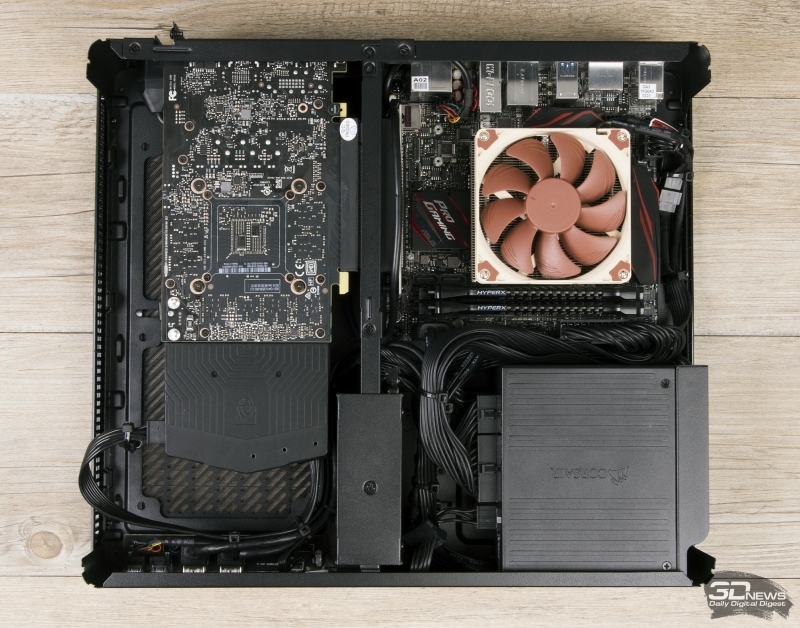 For example, last year our website has published a comparative test of motherboards form factor mini-ITX features chipset Z270 Express. There were considered only six models, and readers became acquainted with all the available at that point in time the devices with such characteristics. Actually there are two form-factor motherboards that meet the size 170 × 170 mm. These boards features a full PCI Express x16 and DIMM slots to install two memory modules. There is a separate form factor Thin mini-ITX — boards based on it are suitable for the Assembly even more compact UCFF (Ultra Compact Form Factor), as the platform Assembly has a thickness of 25 mm. they use the two connectors SO-DIMM to install laptop RAM and no PCI Express x16. To build truly productive gaming system with the use of high-frequency RAM and a discrete graphics card of GeForce GTX 1080 Ti such models, of course, are not suitable. Form factor motherboard reglamentary her mounting options — size, position of mounting holes, connectors for expansion boards and sites ports I / o. In the rest of the motherboard makers are free to act as they want. 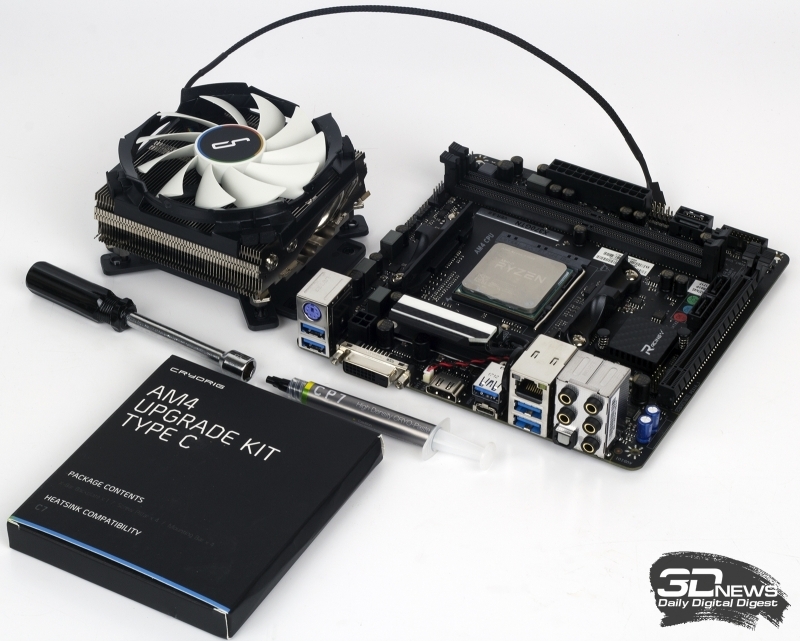 As a rule, the Board form factor mini-ITX have two DIMM sockets and one PCI Express x16. The most popular option is the wiring of the components shown in the pictures above. 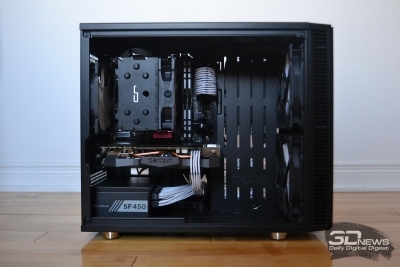 It’s better suited to build a gaming computer, as the CPU socket is maximally removed from the connector PCI Express x16 slot, therefore, overall, the cooler does not prevent the installation of the graphics card. I do not advise to take a Board with custom connectors for connection of the power supply. Today you can assemble a computer, focusing on three recent and current platforms: AM4 processors Ryzen first and second generations, LGA1151-v2 for chips Coffee Lake and LGA2066 for processors Skylake-X and Kaby Lake-X. 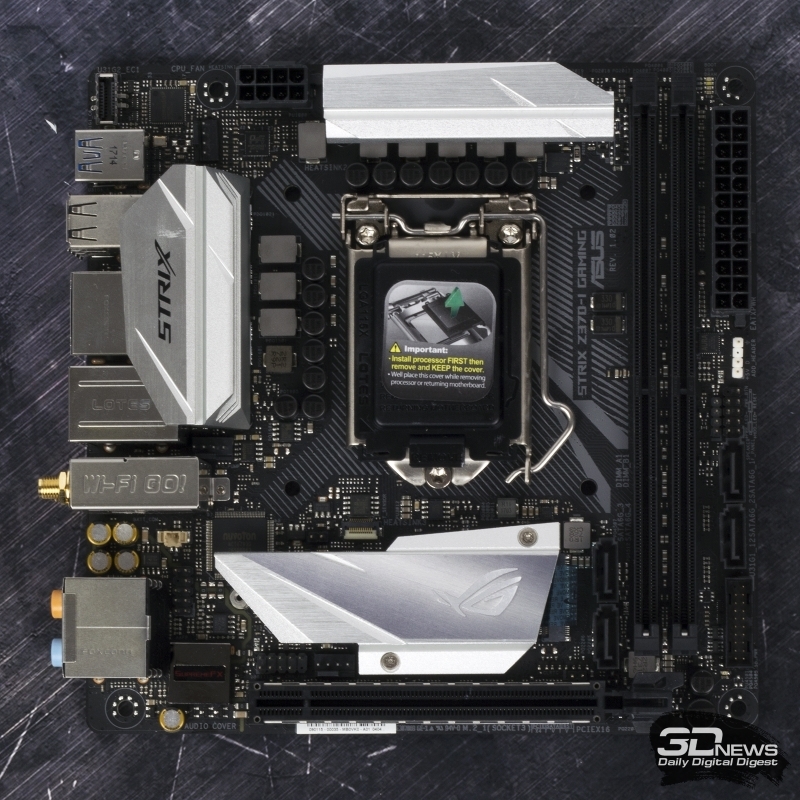 the Latest platform represented by only one motherboard — ASRock X299E-ITX/ac. In the second part of the article I will focus exclusively on solutions based on AM4 and LGA1151-v2. Graphics segment Low-end in most cases are not large. Let the proof of my words will serve as the recent comparative test of eight models GeForce GTX 1050. What is really lacking in the market — so it is an efficient, low-profile graphics cards. In 2018, you can count only on the model on the basis of younger versions of the chip GP107. However, the performance of GeForce GTX 1050 enough at best for gaming at medium graphics quality settings. But there are interesting models of the buildings in which such card would be very appropriate. 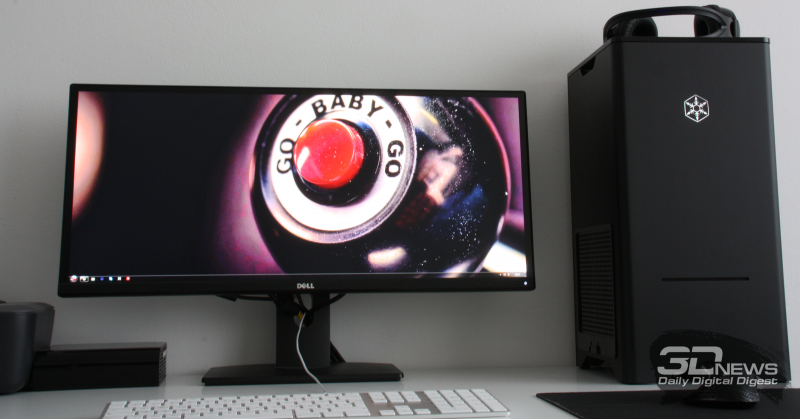 For example, SilverStone ML05B. In fact when assembling a compact system unit, it remains only to determine the power supply. If the capacity of the “breadwinner” of the PC all clear, the form factor, not so much. 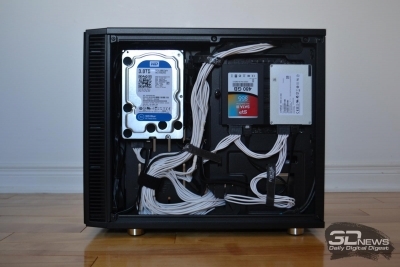 In buildings-the barebones and Mini-Tower in most cases have the option of installing a full-sized ATX models. In all cases it is better to use a device with modular cables management. We are dealing with small buildings, but because in some cases laying unused wires will be a bit of an adventure. Sogah SF600 600 W (7 500 rubles). Typically, the power supplies form factor SFX are high efficiency, compliant with 80 PLUS Gold and higher. Including this is due to the high cost of these devices. BP, with a capacity of 450-600 watts is enough for a gaming system with a processor-level Core i7-8700K and video card-level GeForce GTX 1080. Another feature of the SFX-blocks are short wires. For example, during Assembly of the system in case of Dr Zaber Sentry didn’t have enough length of the 24-pin cable of the PSU Corsair SF600. ASRock engineers in the design X99E-ITX/ac for some reason placed the connector in the top of the card, while usually matplot form factor mini-ITX it is wired in right. There usually are two DIMM slots for installing memory modules. In the end had to use a 30-inch extension all-in-Alchemy 24pin. To determine the other components will not be difficult. 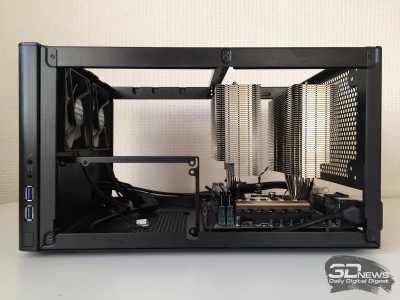 If you build a system in the body Slim Desktop using a powerful chip-level Core i7-8700K or Ryzen 7 1800X, you have to break your head over the choice of the CPU cooler. For example, in the case Fractal Design Node 202 is placed on the cooling system height up to 56 mm, but at the same time, such popular models like the C7 and AMD Noctua NH-L9I, will not cope with cooling these CPUs. These solutions are suitable for chip, the TDP level of 65W. Processors with a large heating package cooling better with other devices, such as Scythe Kozuti (SCKZT-1000) and its AXP-100 Muscle. In the case of CPU Coffee Lake it is advisable to scalp. When choosing a SSD, I recommend to focus on model form factor M. 2. The use of such storage will save space in the basket for a 2.5-inch storage devices, and also saves us from having to lay additional wires. Generally, it is considered that the installation of the SSD on the back of macplay to anything good will not, because the hot drive (but modern NVMe device is sufficiently strongly heated) will be trapped in the narrow space between the PCB and the cover. In this regard, of course, much depends on the case. For example, Phanteks Enthoo Evolv Shift M. 2 drive just not be good, because it is between the mother Board and video card. In any Lian Li PC-05, on the contrary, the SSD mounted on the back of macplay will continue to Abdovitsa corps fan.